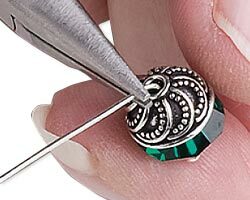 Top off a bead using a bead cap. Finish it with a simple loop that attaches easily and securely to a link on a chain or pair of earrings for a simple and stylish dangle. 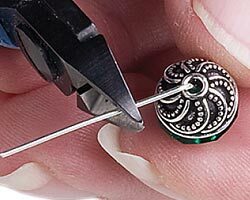 Place a bead and a bead cap onto a headpin. 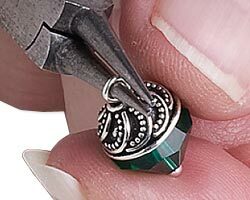 Using chain-nose pliers, grip the wire right above the bead cap and bend the wire to a 90 degrees angle. Hold the flush-cutters so the flat side is facing the bead and trim the excess wire to 3/8 inch. Grip the tip of the cut wire with your round-nose pliers. Rotate your wrist, wrapping the wire around one barrel of the pliers to create a loop. 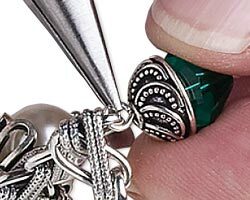 Using chain-nose pliers, open the loop of one dangle up and not out to the side. Add the open loop to one link in the chain and close the loop to secure. Repeat adding drops all along the length of the chain.